UPDATE 5/1/12: I called Demonstrator support again and the rep explained that the Mixed Bunch stamp set, the Apothecary Art stamp set, the Loving Thoughts stamp set, the Love & Laughter stamp set, the Baby Prints stamp set, and the Mouthwatering stamp set are being CARRIED OVER to the NEW 2012-2013 Annual Catalog. So, they are not included on this list because they are not available to purchase until the New Annual Catalog starts June 1st. What is not on this list but can currently be purchased is the Simply Scored Tool (item #122334) and the Diagonal Scoring Tool (item #125586). 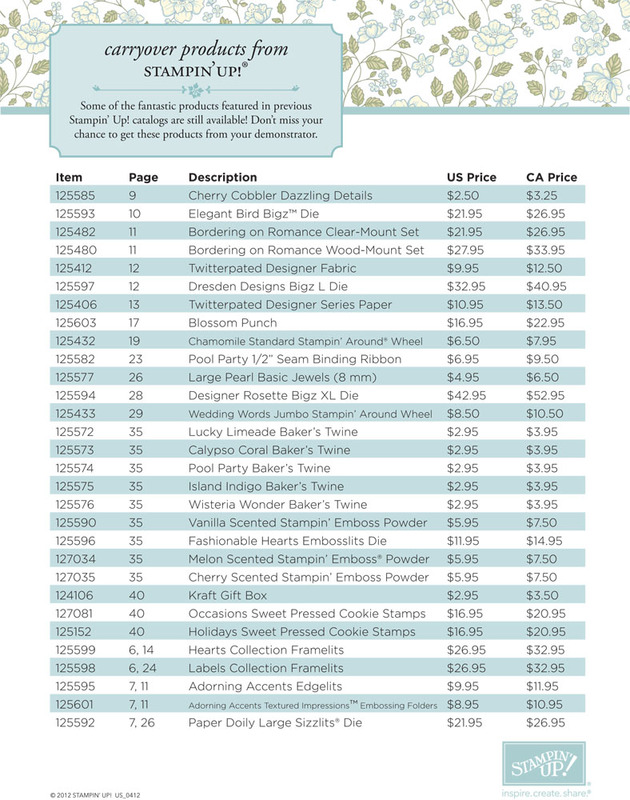 Finally, Demonstrator Support confirmed that all the Accessories and Big Shot Dies listed above are getting carried to the NEW 2012-2013 Annual Catalog! So, these are still a great "Sneak Peek" for us!